Start your free 30-day trial of Webroot® Security Awareness Training today—no risk, no obligation to buy. Cybercriminals target end users. Ongoing cybersecurity education and training for end users is a must for businesses to stay secure. Studies have shown that quick, relevant, and continuous training throughout employee’s tenure with a company are the best way to arm end users to become an organization’s first line of cyber-defense. Although businesses may feel their employees wouldn’t be fooled by something like a phishing scam, cybercriminals still use this attack method because it continues to be successful. In fact, the 2018 Verizon Data Breach Investigations report revealed that 93% of successful security breaches start with phishing. With regular training that includes phishing simulations, courses on IT and security best practices, and data protection and compliance training, businesses can significantly reduce risk, decrease infections and related help desk costs, protect their reputation by experiencing fewer breaches, and secure their overall cybersecurity investment. User error accounts for up to 90% of successful breaches. With computer-based training, you can significantly change the odds. Ongoing user training ensures your clients are kept up to date on the latest methods of attack, so they stay on track and out of the headlines. Protect users and data, avoid fines, and ensure compliance with SEC, FINRA, PCI, HIPAA, GDPR, and other regulations. Our learning management system lets you launch effective education programs in minutes. You can also schedule training and reports to run automatically. Launching realistic phishing simulations lets you accurately monitor real-world user responses, then direct awareness programs to users accordingly. Succinct, easily-consumed, interactive courses increase end users' attentiveness, as well as the overall effectiveness of cybersecurity education programs. Measuring individual and overall success is key. The LMS keeps track of user participation, making all education accountable and measurable. Our campaign management wizard, contact manager, email templates, course library, and reporting center let you schedule and assign training efficiently. Activity reports can be shared with management to measure progress, risk score, and ROI. Training reports show user progress so accountability and value are always clear. business' and clients' security posture and meet compliance regulations. Description: Best practices every end-user and employee should know to help reduce risk of malware infection and company breach. Usage: Annual and new-hire security awareness training. 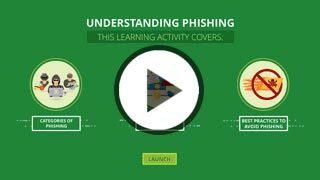 Description: Comprehensive phishing course with an overview of different types of phishing attacks, the risks phishing poses to users and companies, as well as best practices to avoid falling for a phishing attack. Includes real-world scenarios and examples. Description: Privacy awareness for the workforce of global organizations. Focuses on key concepts around privacy that are common across international jurisdictions including GDPR. 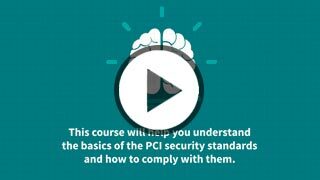 Description: This course will help you understand the basics of the PCI security standards and how to put the knowledge into practice while at work. What is PCI DSS and who needs to comply? Description:A general overview of cyber security risks and best practices to stay safe. Usage: Annual, new hire or as needed.. Description: A topical course on the risks of phishing and how to avoid them. Recommended usage: Monthly, bi-monthly, or as needed. Description: A topical course on the risks of browsing malicious websites and installing software and how to stay safe. Recommended usage: Monthly or bi-monthly. Description: A topical course on physical security and how to reduce risk around the office. Description: This course gives end users a basic understanding of malware risks. Description: Overview of social media and risks around usage at work. Usage: For topical tips and training. Description: This course helps you gain a comprehensive understanding of ransomware, encryption, and cybersecurity. You’ll learn how to keep your information safe and how to help prevent future attacks. Usage: Topical course and cybersecurity reinforcement. Description: A topical course on email security, the importance of protecting your inbox along with best practices to reduce risk. Description: A topical course on password best practices including the importance of multi-factor authentication and password managers. Description: Keeping your work community safe and secure. Description: This course reviews the different types of ransomware—including scareware, screen lockers, and encrypting ransomware—as well as the laws against them and the steps you should take to prevent an attack. Usage: Use as a topical course and cybersecurity reinforcement. Description: A look at how cybercriminals use ransomware to profit from individuals, businesses, hospitals, governments, and more, this course reviews the 2017 WannaCry attack to help you better protect your systems and sensitive data from future attacks. Description: This course covers risks associated with remote workers and business travellers along with best practices to stay safe. Usage: Annual, new hire or as needed. Description: A compliance course on HIPAA including privacy, security, breach notfication laws. Description: A topical and compliance course focused on data breaches and the responsibility of notification along with best practices to reduce risk as outlined by Australia's data breach notification law. Australia focused with best practices for everyone. Usage: Annual, bi-annual or as needed. Description: This condensed version of the full GDPR course gives an overview of the new General Data Protection Regulation and its impact on organizations that store or process EU citizen personal data, raising employee awareness around these new requirements. Usage: Introductory or refresher course to GDPR. Description: A compliance course focused on the UK-based Bribery Act of 2010. Description: A compliance course focused on the UK-based Freedom of Information Act. Description: A UK compliance course that includes an overview of whistleblowing, why it is important, and how you are protected under UK law. Description: Best practices around data privacy and protection with a focus on compliance principles required by the EU/UK Data Protection Act. Usage: EU/UK based compliance course for Data Protection Act and general best practices around data privacy. Description: An awareness course on money laundering, what it is, why it's illegal, and how to recognize it. Whether you're a Business or MSP, you can easily add Webroot Security Awareness Training to your existing account or contact us to start a FREE 30-day trial for up to 50 users.